Most workers have a looming tax bill they know nothing about. But even as the big stock market plunge reminds many of the scary bear market of 2008 and 2009, there's a potentially huge silver lining for enterprising investors. The strategy you should consider involves any traditional IRA or 401(k) accounts that you have. If you take the opportunity to convert your traditional retirement assets to a Roth IRA or 401(k), you'll be able to lock in what may prove to be the lowest possible taxes on your long-term nest egg. To understand why you might want to do a Roth conversion, you first have to understand how your regular retirement accounts work. With a traditional IRA or 401(k), you get a tax deduction upfront. Throughout your career, your IRA assets can earn income and capital gains without your having to pay tax. When you retire and start taking money out, though, you'll pay ordinary income tax on your withdrawals. What a Roth conversion does is to transform your retirement assets into a vehicle that allows tax-free growth throughout your lifetime. When you withdraw money from your Roth, you pay nothing in tax. But there's a price you have to pay when you convert: Whatever the value is that you convert is treated as taxable income on this year's tax return. In other words, by converting, you're agreeing to pay taxes sooner than later. Why would you want to do that? There are several reasons why paying tax now rather than in the future might make sense. For instance, many expect tax rates to rise in the future. By converting to a Roth now, you essentially lock in today's current, relatively low rates for what may be substantial retirement dollars. You may have to be careful not to convert so much that you push yourself into a higher tax bracket, but in the long run, you can end up a winner on the tax front. But the biggest reason why now may be the best time is because the amount of tax you pay is based on the value of the assets you convert. So with stock prices as low as they've been in a year, your tax bill from converting will be a lot less now than it would have been just a month or two ago. You might wonder, though -- what happens if the market keeps dropping? The amazing thing about the Roth conversion is that you can undo it. By using what's called a recharacterization, you can essentially reverse the process if your investments fall further -- giving you a chance in the future to do the same thing again at even lower tax cost. If you convert today, you have until mid-October 2012 to see how things work out -- and to get your recharacterization do-over if the Roth doesn't end up making you money. What you need to do to take advantage of the Roth conversion depends on what type of account you have. If you have an IRA, it's as easy as contacting your broker, fund company, or bank that has the IRA and telling them you'd like to convert to a Roth. You'll have some paperwork to fill out, but other than that, the process should be close to automatic once you get started. Converting a 401(k) may be trickier. 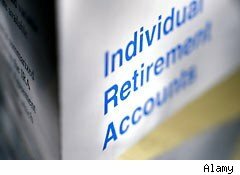 If your employer has a Roth 401(k) option, then it may be fairly simple to convert money into that part of the account. Without that Roth 401(k) choice available, though, you may not be able to convert your 401(k) money until you retire or change jobs. One last thing: Converting your Roth will boost your taxable income. That can have other consequences, such as taking away certain deductions and credits that you'd otherwise be entitled to. Unless you figure out all the consequences of a conversion -- or have your accountant do so for you -- then you could get a nasty surprise come tax time next year. Tax strategies like the Roth conversion are more complicated than they ought to be. But what they boil down to is that you can use the recent drop in the market to cut your future tax bill. Paying lower taxes is something that everyone can agree is a good idea. Motley Fool contributor Dan Caplinger is one of those rare people who don't find talking taxes taxing. You can follow him on Twitter here.